Human computer interaction (HCI) plays a vital role in bridging the 'Digital Divide', bringing people closer to consumer electronics control in the 'lounge'. Keyboards and mouse or remotes do alienate old and new generations alike from control interfaces. Hand Gesture Recognition systems bring hope of connecting people with machines in a natural way. This will lead to consumers being able to use their hands naturally to communicate with any electronic equipment in their 'lounge.' This monograph will include the state of the art hand gesture recognition approaches and how they evolved from their inception. The author would also detail his research in this area for the past 8 years and how the future might turn out to be using HCI. 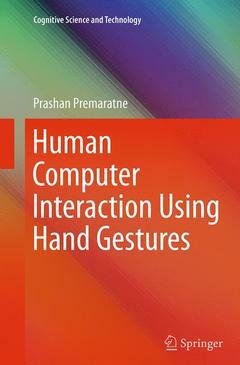 This monograph will serve as a valuable guide for researchers (who would endeavour into) in the world of HCI. Chapter Description.- Historical Development of Hand Gesture Recognition.- Pre-processing.- Feature Extraction.- Effective Hand Gesture Classification Approaches.- Sign Languages of the World.- Future Trends in Hand Gesture Recognition. Dr. Prashan Premaratne is a Senior Member of IEEE and has been a Guest Editor of Bio-Inspired Computing and Applications 7th ICIC, Guest Editor of International Journal of Information Technology 11(12); Guest Editor - International Journal of Wavelets, Multiresolution and Information Processing (IJWMIP); and Guest Editor on a special issue in Neurocomputing Journal (Elsevier, 2006). He is also an ARC OzReader in Mathematics, Information and Communication. He was the Tutorial Chair of ICIC2008 conference in Shanghai, China and was the Program Committee Chair of ICIC2006 conference held in Kunming, China. He has also published over 80 IEE/IEEE refereed publications in signal and image processing and has been invited to chair sessions in major IEEE conferences such as ISIMP2004, in Hong Kong and ICIC2005 in China, ICIAFS 2008, ICIAFS 2010 and IASTED-EAS 2012.